A TV documentary has given an intimate portrait of the Queen ahead of her 90th birthday. But what titbits about life as a royal did ITV's Our Queen at 90 reveal? 1. 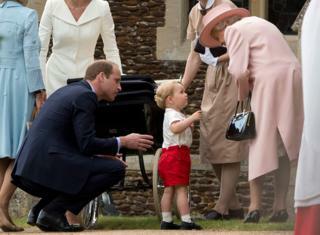 Prince George calls the Queen, his great-grandmother, "Gan-Gan". 2. There's a cushion bearing the slogan "It's good to be Queen" at Balmoral. 3. The Duchess of Cambridge is teased by other, more experienced members of the Royal Family for spending "too long chatting" on walkabouts. 4. The Queen sits with her handbag behind her on her chair, at least when filming this documentary. 5. William Trevor's Fools of Fortune is among the books on the shelves at Balmoral. 6. The Duke of Cambridge got the names of two countries "muddled up" at his first diplomatic reception, which was "quite embarrassing". 7. David Cameron and the Queen discuss the countries they have and haven't visited during their weekly meeting at Buckingham Palace. He describes "a great and exciting moment" when he came up with one she hadn't been to. 8. Polishing the cutlery used at State dinners starts around two months before the event takes place. 9. The Queen has the word "plonk" in her vocabulary.